I’m enjoying watching the gentle loll of the modern cider revolution as it gracefully strides into view of beer lovers. Cider is unquestionably having a bit of a moment of late, and it feels like we’re at the foot of a much bigger mound when it comes to what many consider to be beers sister-beverage. For me, cider is far closer to wine, especially orchard-based, low intervention cider - pulling fruit from local orchards, and allowing it to ferment naturally as it matures into a finished product. In fact I personally feel that much of modern cider forms the perfect bridge between beer and wine. We’ve got some work to do before cider can get to a point where it’s fussed over like so much modern beer though. One producer attempting this is Hawkes, based on Bermondsey’s Druid Street, amidst the largest feast of brewers within the capital. The fact that the cider maker is now owned by BrewDog might give you some inkling on how close to the beer drinkers table cider is at the moment - and of the cider maker's sizable ambition. 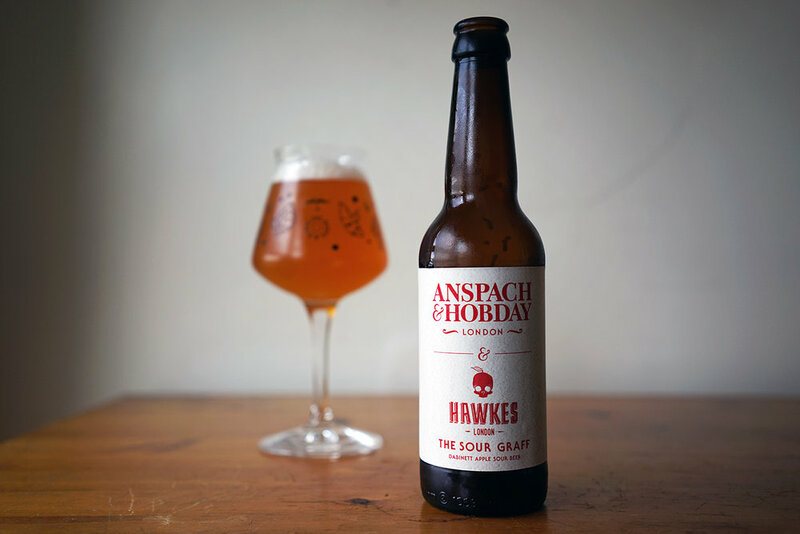 The Sour Graff is a hybrid beverage produced with Hawkes’ Druid Street neighbours Anspach & Hobday. The base beer is a Berliner Weisse, which then sees the addition of Dabinett apple juice prior to fermentation. What I particularly enjoy about this is the seeing the apple varietal get a namecheck, front and centre. In a world where hops are such a strong hook for beer enthusiasts, dangling a carrot… err, apple, like this lends the beer drinker the next rung to swing from. I was also pleased to find such an approachable beer beneath the cap. Fans of sours will be immediately drawn to its sharp, tart quality. The apple flavour is sweet and fizzy, like a mouthful of sour-apple pop rocks, but the dry finish smoothes this out. If you can overcome the initial sharpness of how sour this beer/cider hybrid is, then you’ll find a beverage that is simple and eminently drinkable - perfect for long summer days. Behind all of the fun this drink provides, however, is just the faintest hint of farmyard funk. Not enough to challenge, but - for those that find it - enough to perhaps pique an interest in the wider world of cider. In this respect, The Sour Graff is a great introduction to cider for those who have not yet decided if they like it or not. You can find more from beer writer Matthew Curtis as UK editor of Good Beer Hunting and on Twitter @totalcurtis. If you're quick, you'll be able to find a last bottle of The Sour Graff in store or online. Our Deptford shop opens this weekend!